Lysa & Huey Ink! : If I Could Be A Rag Doll! If I Could Be A Rag Doll! As you may know I am trying to finish old projects while working on current ones. I was determined to make a large photo project using a vintage Rolodex address card holder. My plan was to make mini digi scrapbook cards of my favorite pictures of Rory. Instead of starting at the current point in time, I decided to start with her birth. Wrong move! As I poured through about 3000 digital photos I noticed that I spent more time saying "Oh my Lord! How cute is she!" OK, so it did not quite pan out as I had planned. Meaning I started it and never went back to it. So being inspired by Kris's "Finish it Friday" I decided I would try to commit to at least 1 Rolodex photo card a week. 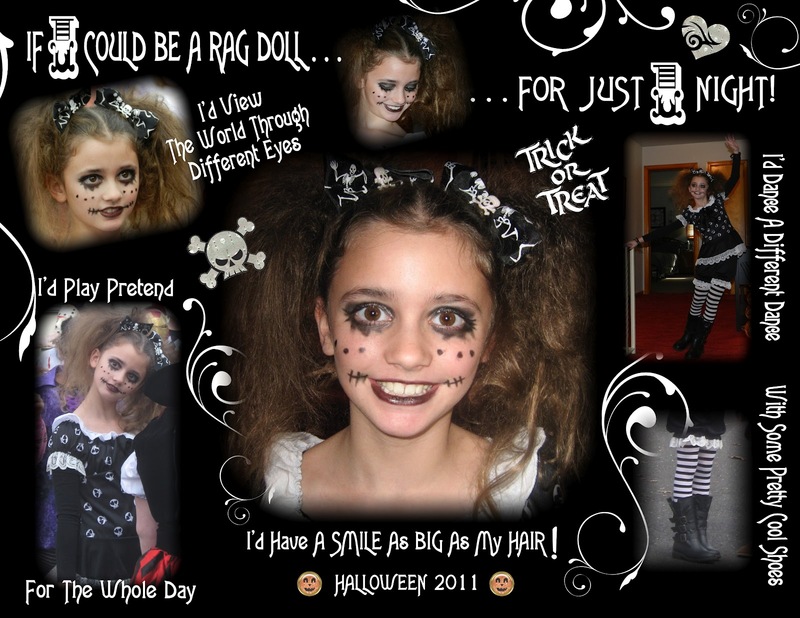 So this week I worked on Rory's Halloween 2011 photo cards. I wanted to use 3 pictures that were taken Halloween 2011. She looked great in her costume. I originally used the Stamp'in up Sizzix die to cut the cards. Now I am using the ZING and its Print N Cut feature and it worked great. I am still making the photo cards in DSA2 and importing them as a texture into MTC. Every time I use the ZING I am in awe of how dead on the PnC is! Here are my pictures for this week. I also made one 8X10 photo for my cube at work. Please can I say just one more time "Oh my Lord, How cute is she!" 100 Down - 100 To Go!